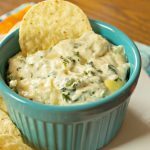 If you are looking for a fantastic dip that you can serve warm straight from your slow cooker OR even cold look no further than this cheesy dip that is filled with spinach and artichokes. 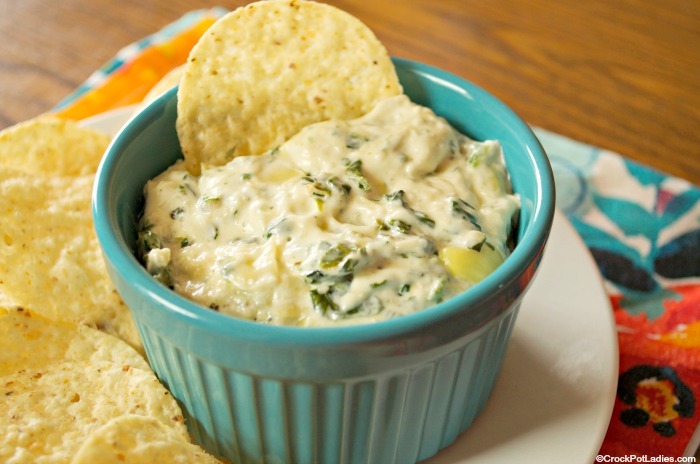 Garlic, Parmesan cheese and mozzarella cheese make for a super tasty dip and frozen spinach and canned artichoke hearts bring in some great flavor. Grab your favorite tortilla or pita chips, slices of crusty bread or even fresh vegetables like carrot sticks, celery sticks and jicama sticks and dip on in. 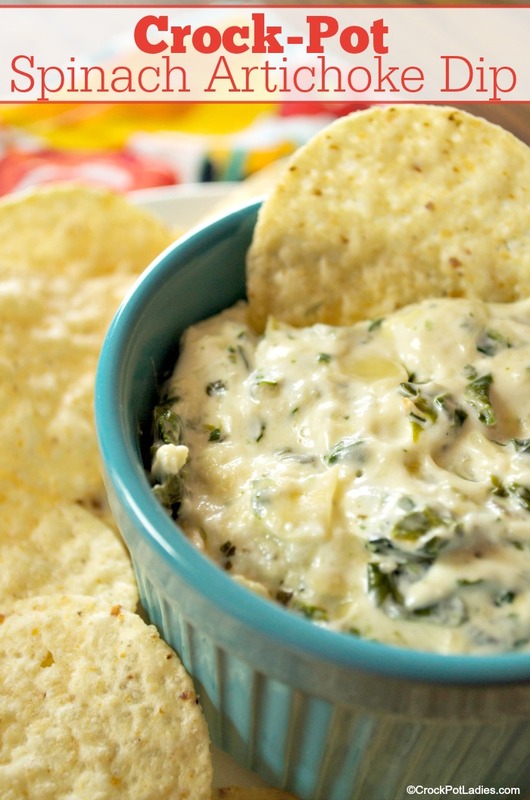 This dip is perfect for your next party or get-together! With just a few ingredients you can have this cheesy dip ready to go in your slow cooker in a matter of minutes. Serve with your favorite chips, slices of crusty bread or cut up vegetables. 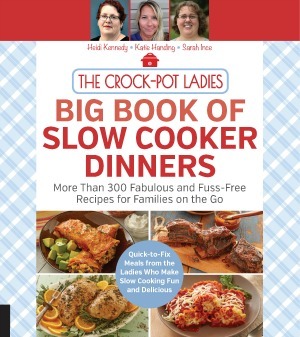 Add all ingredients to a 2.5 to 3.5 quart slow cooker and stir to combine. Cover and cook on LOW for 2 to 3 hours, stirring occasionally until the dip is hot and all the cheeses have melted. Serve in bowl or from the slow cooker on the WARM setting. This dip can be easily turned into a delicious pasta sauce by adding 2 to 3 cups of milk, half and half or cream after the dip has cooked. Just slowly stir the milk into the dip after everything has melted until it reaches a pour-able consistency and serve it over any type of cooked pasta!